Let's say you want to send a big file to your friend John. Well, instead of attaching the real big file to the e-mail you are writing, Podmailer sends only a small file which references the real one. This small file is called a podmail (.zed). 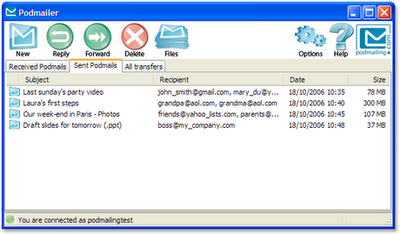 Upon receiving your e-mail, John opens this podmail (.zed) with Podmailer, and the transfer of the real big file starts directly between John's computer and yours. If this sounds familiar, it might be because you've already heard of Pando, a rival service that offers attachments up to 1GB in size. In Pando's case, you send a .pando attachment that links to the real file, which you've already uploaded to Pando's servers. Files are either downloaded directly from your computer or from Pando servers. By contrast, Podmailer is more purely P2P in the sense that you have to be connected to the Internet and be running Podmailer's software to transfer your files to the recipient. Otherwise it won't work. On the plus side, larger file sizes are allowed. Recently, they've upgraded to Amazon's S3 web service, which will allow them to implement an Express service so they can host your files just like Pando and overcome their current limitations. The evolution of these services isn't likely to stop. 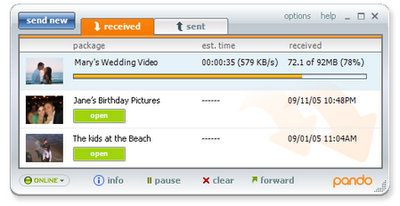 Pando has recently gone into the file hosting business, competing with rivals like RapidShare and Mediafire. Once you have the infrastructure (i.e. storage capacity), it's not too hard to expand into cosmetically different hosting services.